This is a sponsored post written by me on behalf of Smile Brilliant. While I was compensated for this post, all thoughts and opinions are my own. Let’s talk teeth! Specifically, teeth whitening. Ever since I completed my Invisalign treatment a few years ago I have had issues with teeth whitening. First of all the whole time you are in treatment you can NOT do whitening treatments. No whitening toothpaste, strips, lights, professional whitening, nothing. It was a loooong six months y’all. LOL!! One of the things they warned me about was that since my teeth were being moved and rotated that I would notice teeth that weren’t as white as the others (because they had been that way in my mouth for 30+ years and hadn’t been exposed to the light or any of the whitening treatments that I had previously done) and so I expected it. What I didn’t think about was how hard it was going to be to get them to match my other teeth when it comes to teeth whitening. 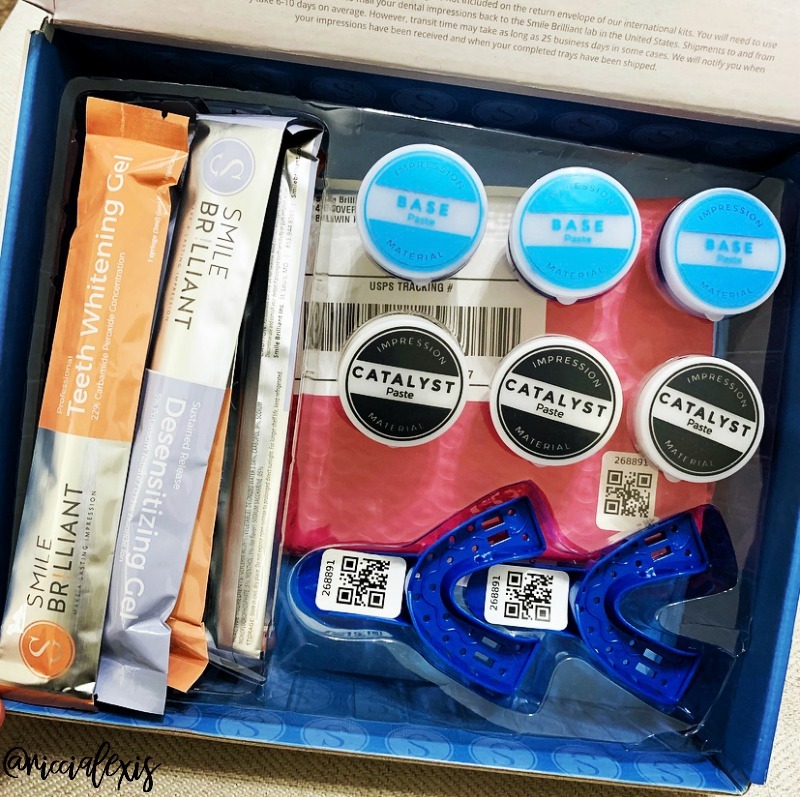 Since I completed my Invisalign treatment almost four years ago I have literally tried it al when it comes to at home teeth whitening systems. I have consistently used whitening toothpastes, tried white strips, even purchased one of those teeth whitening lights. Needless to say nothing worked to even out the whiteness of my teeth. I wasn’t looking for perfectly white teeth, more like teeth that matched color-wise. LOL!! It’s really not even that noticeable, I just notice this on tooth on my top left that isn’t as white as all of the others and it’s been driving me insane!! See the tooth I’m talking about? Top left (your right if you’re looking at it from this angle) next to my front tooth?? This is a selfie from last fall for reference. Enter into the picture, Smile Brilliant. 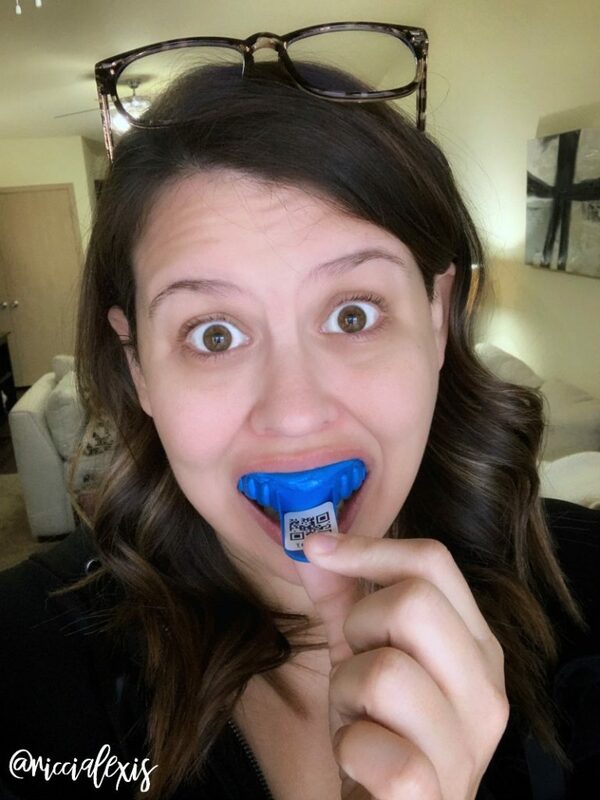 The amazing people at Smile Brilliant contacted me at the end of January to see if I wanted to try their at home teeth whitening system and I jumped at the chance! I was so excited to get the kit and make my molds. It kind of reminded me of getting fitted for my Invisalign trays…LOL!! So after you make your impressions, you send them off and then you get your trays back! 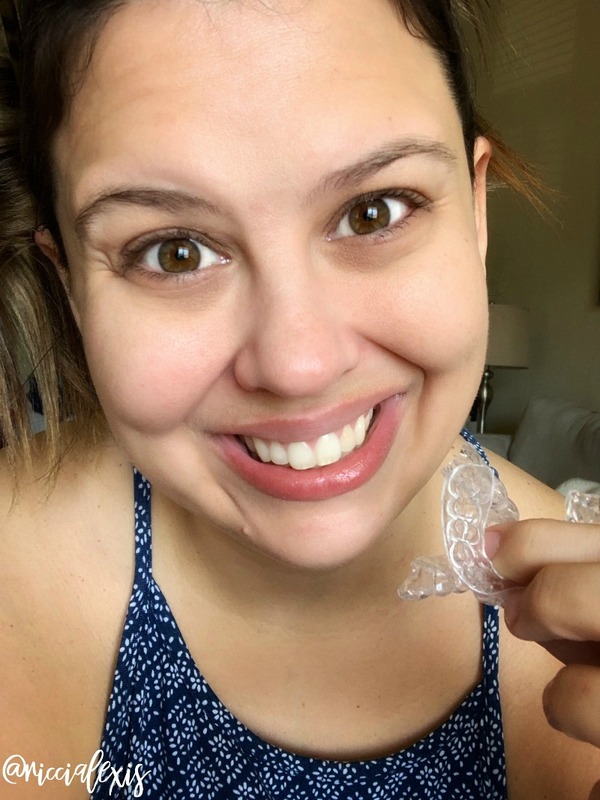 For some reason in my head I thought they were going to be hard plastic like my Invisalign trays but they are actually really soft and flexible! Your kit comes with the whitening gel and some desensitizing gel in case your teeth get sensitive during treatment. This is one reason I have never tried professional whitening at my dentist’s office, I have heard that your teeth are SUPER sensitive after that and I want ZERO PART of super sensitive teeth!! I am happy to report that I only had to use the desensitizing gel one time (after my first use, even when I upped my use to every other day! So how does Smile Brilliant work? 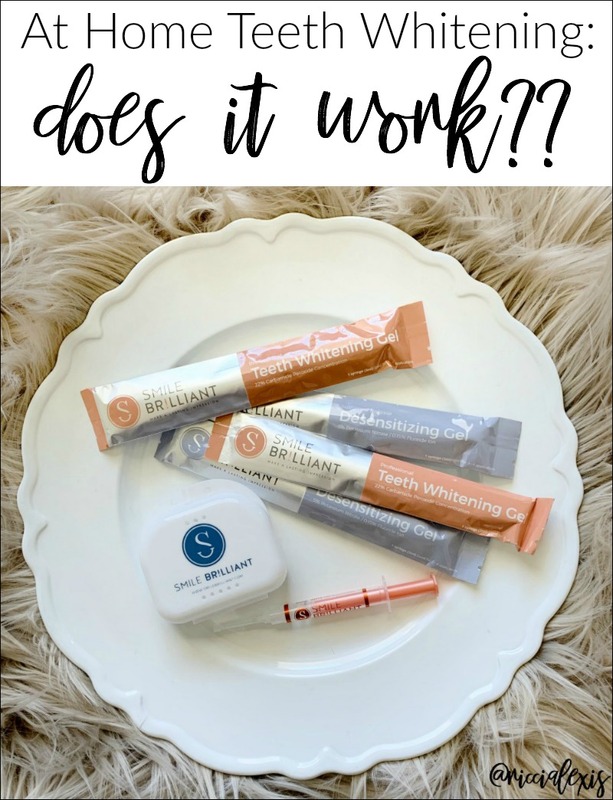 You start with clean teeth (don’t brush with toothpaste but I did a quick brush with just water just because that felt “right”), apply about a third of the whitening gel to your trays and put them on! You can do anywhere from 30 minutes to 3 hours at a time and you can even use them daily if you can handle it. I started with once a week (I’m a WIMP) and then upped it to every other day. I even put a smidge more gel over the tooth I wanted to be a little whiter and I think it worked because I feel like me teeth are more even now?? That may be in my head but overall I am extremely happy with the results! I even took before and after pics just so I could see the difference side by side! Excuse the awkward up close and person TEETH pic. Also, I think I smile funny?? Probably just because it’s so up close and personal…LOL! 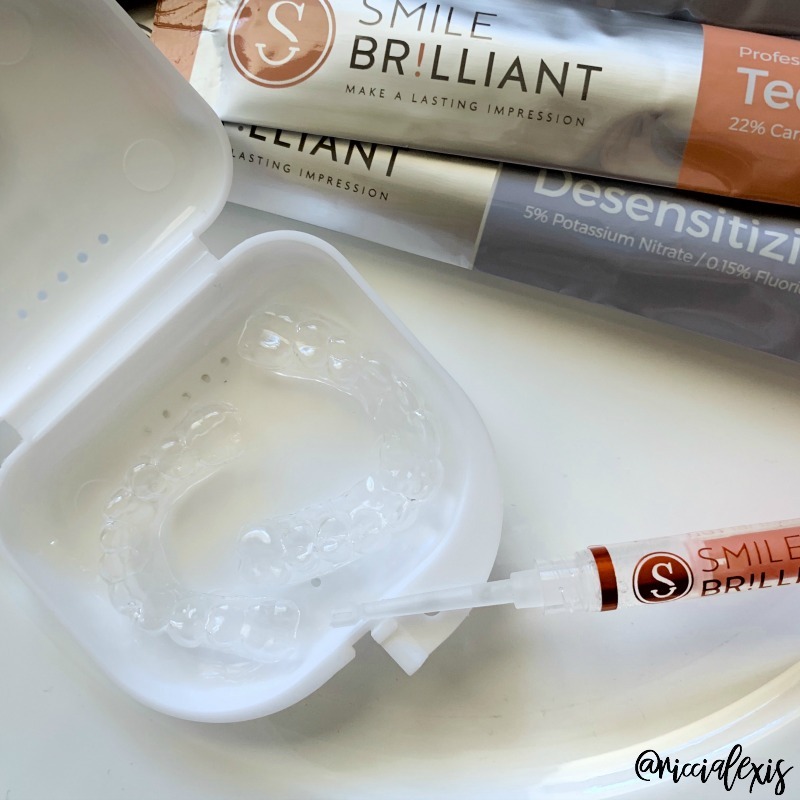 The amazing people at Smile Brilliant are offering a $149 credit (the cost of a teeth whitening system) to ONE lucky reader!! Get yourself entered HERE!! The giveaway is open to USA, UK, Australia, and Canadian residents and will run for 2 weeks. Good luck to all who enter!! 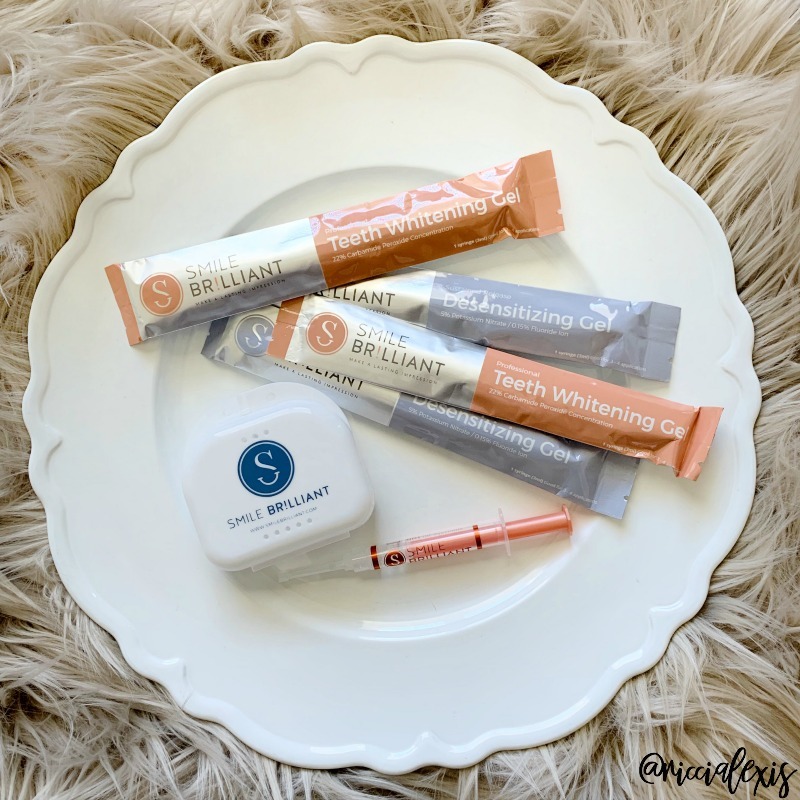 Have you tried Smile Brilliant?? Your teeth look awesome in the after photo! My husband gets his teeth professionally whitened at our dentist’s office but I have super sensitive teeth so this would be perfect for me. You have beautiful teeth. Something I have thought about doing but wasn’t sure. Seems easy and straight forward. Your teeth look amazing so yes, I can see it DOES work! I’d like to do this at some point. I will have to check out Smile Brilliant for sure. Oh wow, that really does work. I’ve always wondered if at home treatments were worth the cost and I can see now, that they are. I need to whiten mine. I drink too much coffee and tea for regular brushing to do the trick. I tried Smile Brilliant a couple of years ago. I love that it didn’t require going to the the dentist office. I have not whitened my teeth but they are getting a little off from coffee etc. I will keep this in mind and my husband can use it too. 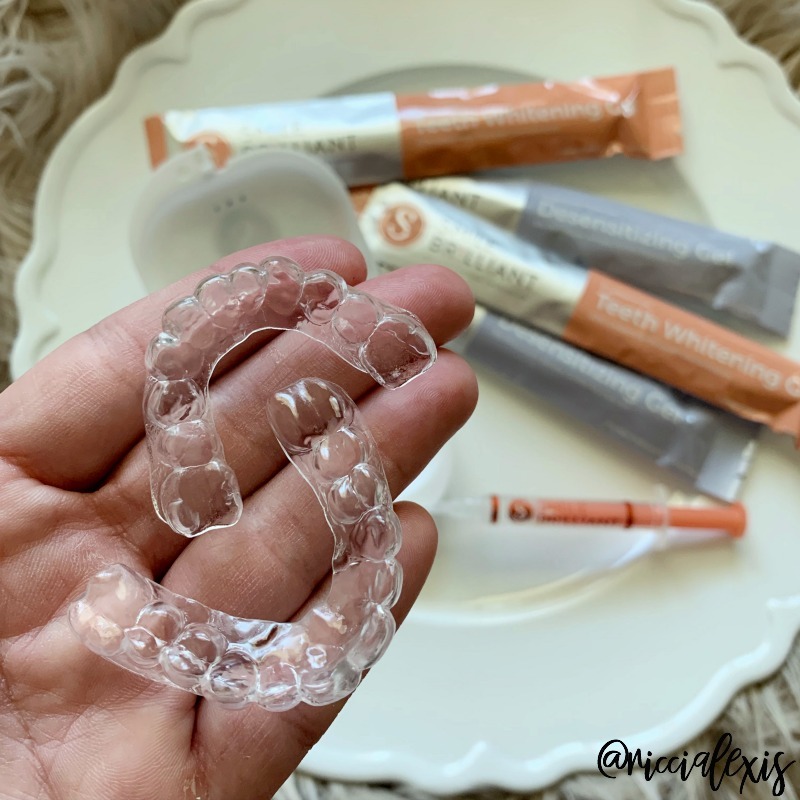 I honestly hadn’t thought too much about whitening my teeth but now that I am thinking about it…. recently I started to drink coffee and I think that is evident now in the color of my teeth. I should try this! 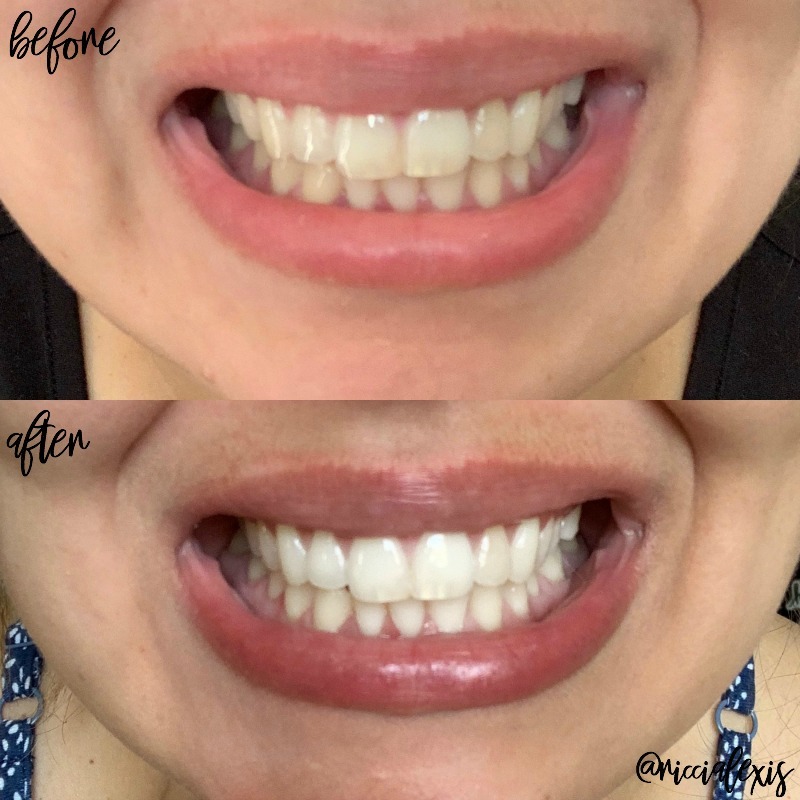 I have been wanting to whiten my teeth but I wasn’t sure what would work and what wouldn’t. This looks like a great option. Wow your teeth look like they got a lot whiter there with Smile Brilliant. I need to try this. My teeth are not at all white right now and to be honest it makes me a bit crazy. It is cool you can do this at home now. I can definitely see the difference between before and after! I definitely see the difference! Your smile is beautiful! We used this about a year ago too! Oh wow! I see the difference and I didn’t have to strain to see it. It is clearly brighter and whiter. I have never tried that and it looks like an awesome product to try. I am glad that you found something that gave you the best result. I’ve never tried whitening teeth at home. But thank you for all these helpful tips! I tried their products once before and liked it. It works really well and come to think of it, I should try it again. Wow – this looks great ! I’m surprised to see that a home whitening kit is so effective. I would definitely prefer this to my dentist’s office! Oh wow. The difference is amazing. It has proven great result! Would love to try this. The product works great! I could see the result, whiter teeth! I’d love to try this. Your teeth look so beautiful now! Love them and loved reading about your journey. I am really wanted to try the straightening system for my front teeth.